There are so many Filipinos proliferating and mushrooming here in Birmingham and majority of us are all nurses and their spouses either working in Tesco, Post Office, carer or porter. We are mostly all Filipinos and there are only few Pinays married to British. But we, as nurses, we are being recruited from the Philippines, Kuwait, UAE, Saudi and we are the nearly the majority of the minorities in England's second city, Birmingham. 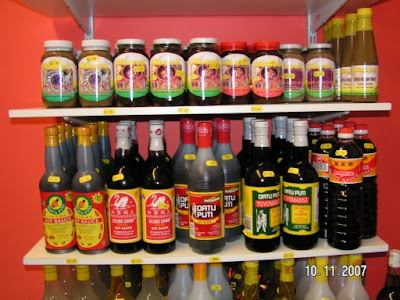 As for this, we all need our own foods, Filipino style. I have so many friends who married a foreigner in Germany, US and Canada but it seems that they have set aside their cultural values in favour of their husband's culture and beliefs of which I think is wrong. I can say this to Pinays who they think that their husbands are more dominating than them. But for us here in UK, we are here to work for our profession as nurses. The Northfield Filipino Community is preserving the Filipino values and pass it on to their siblings. In every party here, it's the same faces that you can see and the camaraderie is still intact for all of us. Their children is learning bilingual (English and Tagalog) or else, their parents will kick their butts. I love our values especially for the respect of the children like kissing your hands every time they see you. What a feeling. That's respect and that respect is nowhere to be found in this country as the children are more liberated. 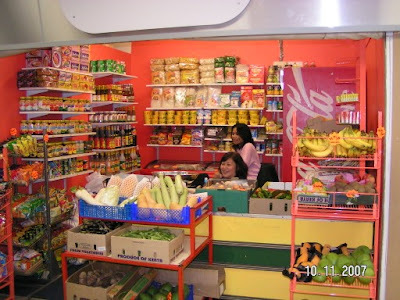 And now, for the 1st time in Birmingham and the entire West Midlands, the Filipino store is finally dropping its curtains to the market. I already said this before and I have to repeat it again for the sake of promotion. 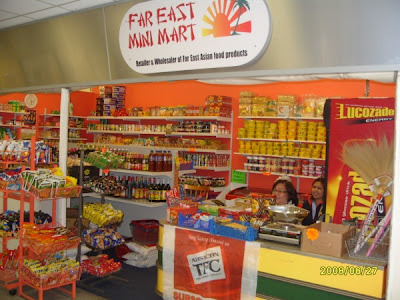 This is being called as Far East Mini Mart. The business of the the energetic and mindful thinking couple of Brendo and Mayette Rivera is exceptional as they crosses the way to success. With their perseverance and determination, I'm pretty sure that this small business will soon to be a bigger one. The store is located in Northfield Markets in Bristol Road South, Northfield, Birmingham, about 6 miles from the city centre and just opposite my house. 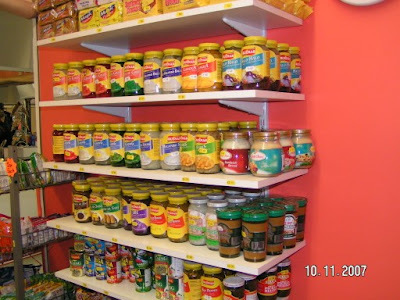 They sold most of the Filipino products like rice, toyo, suka, patis, pancit canton, bagoong, cornicks, ginisa mix, sitsirya,drinks and beverages, TFC subscription, etc, name it, they have it. 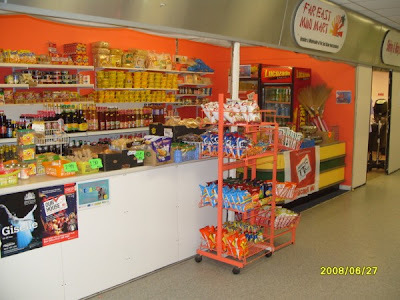 If there's something missing in your kitchen, why not visit their store in Northfield Markets and buy a delicacy or something to add spice to your life. I'm pretty sure that Brendo and Mayette will accomodate you to the fullest. If you can't make it in coming over their store, you can place your order by phone and they will deliver it to your doorsteps with a smile. But sad to say that credits are not allowed. But why not try to beg for credit, maybe you will be granted. This is a free ads for the interests and promotion of the Pinoy store of Brendo and Mayette, my everdearest friends eversince. Filipinos are really fantastic in terms of good values that I think nobody else on this earth can surpass. Even for these days in this modern world, the true blooded Filipino especially for those living in the rural areas will never forget the golden value of Pinoy. I witnessed it by myself when I travelled to Dipolog City together with my dear Jojo and riding a rented pedicab driven by Bobby the true camaderie of my fellow provincemates of Zamboanga del Norte. This is what we called in tagalog, 'bayanihan' but I don't know in bisaya, I think it's 'magtinabangay'. 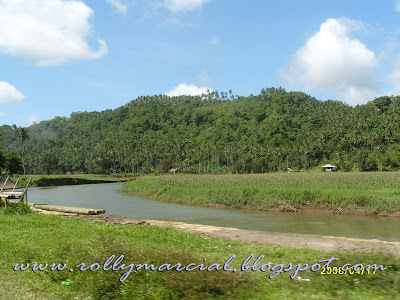 I was actually enjoying the still beautiful scenery of Dapitan river winding at the foot of the mountains in Ilaya. I even captured the scenic view of the river which still the same as before. You know what I'd seen. 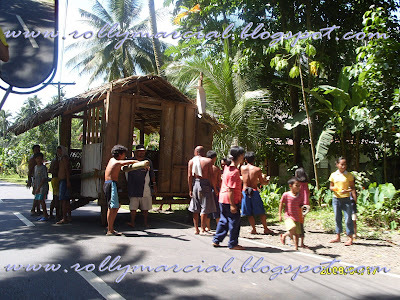 The small nipa house was in the middle of the highway as men carried them across the road. And there were so many people witnessing it and showing their support. It was only a very small native nipa hut but it only showed the strong camaraderie of the community. I don't know if this still occuring in the urban cities. That righteous event was witnessed in my camera and I am so happy about it. I'm very proud of being a Pinoy. Filipinos really valued our good virtues that we inherited from our ancestors. They are good values and it never fade for so many generations has had passed. For us, I am very proud of what I have witnessed and I just hope that this will go on and be passed to our next generation. 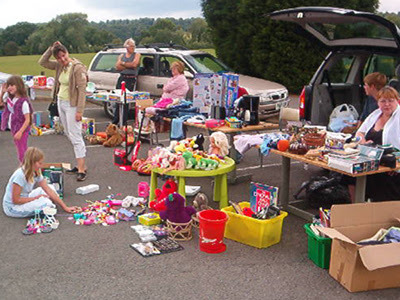 Car boot sales are a mainly British form of market in which private individuals come together to sell household and garden goods. Although a small proportion of sellers are professional traders selling new goods or seconds, the goods on sale are often used but no longer wanted personal possessions. 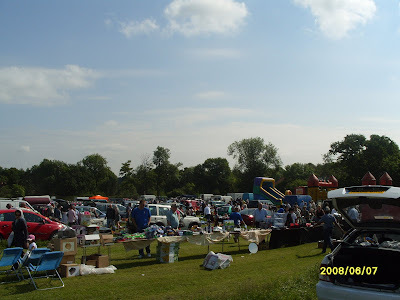 Car boot sales are a way of focusing a large group of people in one place to recycle still useful but unwanted domestic items that previously would have been thrown away. 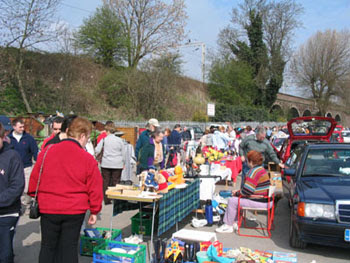 Car boot sales are often held in the grounds of schools and other community buildings, or in grassy fields or car parks. Usually they take place on weekend mornings. Sellers will typically pay a nominal fee for their pitch, and arrive with their goods in the boot (trunk) of their car, hence the name. Usually the items are then unpacked onto folding trestle tables, a blanket or tarpaulin, or simply the ground. 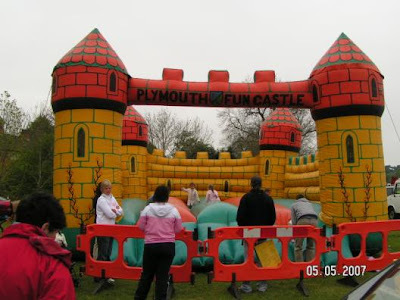 Entry to the general public is usually free, although sometimes a small admission charge is made. Advertised opening times are often not strictly adhered to, and in many cases the nature of the venue itself makes it impossible to prevent keen bargain hunters from wandering in as soon as the first stallholders arrive. 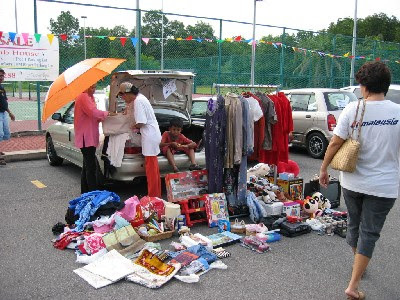 The sales are used to sell unwanted household goods, ranging from old books, records, cassette tapes, CDs, videos/DVDs, toys, stamps and coins, through to radios, old computers, ornaments, tools, clocks, furniture, kitchenware, and clothes. However, a number of commercial sellers often make an appearance, selling plants or vegetables, or new goods such as tools, toys, batteries, ornaments and fittings, paper, pens and other stationery. Almost everything is sold at a small fraction of the new price ranging from 10p to 50p (20¢ to $1) for books, through to several pounds for the most expensive items. Haggling is common at car boots. 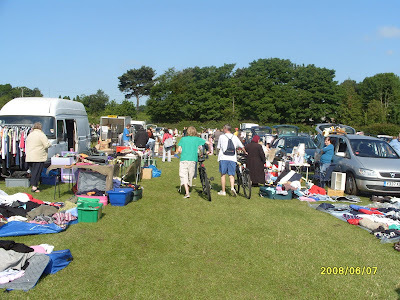 Anyone can sell their goods at a car boot sale, whether a first-timer, a regular, or a seasoned professional. To secure the best pitches, it is best to turn up very early, often from 7am. Often amateurs sell at car boots when they move home or clear out the home of a deceased relative. 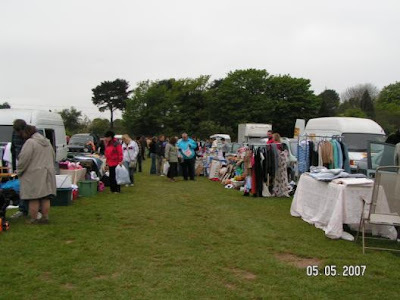 The seller pays a small fee of maybe £5 or £10 ($10 to $20) to set up the stall, which is often no more than a tarpaulin laid out in front of the car boot, on which the goods for sale are displayed. Sellers who are better prepared will come with folding tables or trestle tables on to which they can lay out their goods in a more accessible way. 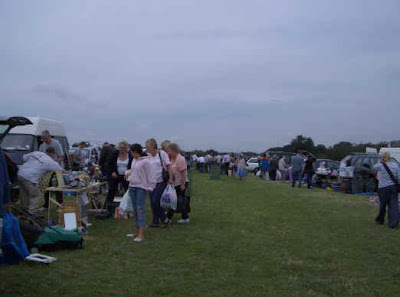 Professional buyers and antique dealers often visit car boot sales in the hope of finding an amateur or one-time seller who has under-priced a valuable item. 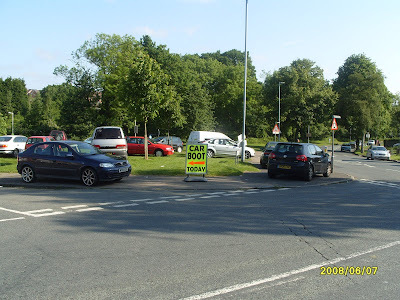 Genuine first timers are often easy to spot and can find it daunting as the professionals flock around their car like vultures before they have even started unloading. 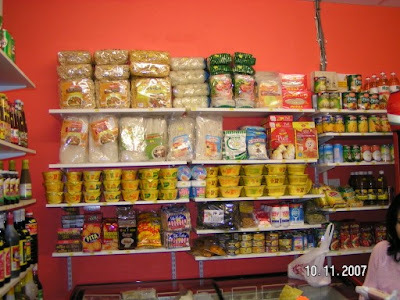 It is sensible for first time sellers to put prices on all their goods before leaving home, as the scrum when they arrive may make pricing difficult in a hurry. Guarantees are rarely given at car boot sales. Often goods that are powered by mains electricity cannot be tested at the sale site. The general rule at car boot sales is caveat emptor - 'let the buyer beware'. However, if a seller describes goods in any way that proves to be false, they are legally obliged under the Trade Descriptions Act to give a refund or replacement or reduce the price to reflect the wrong description or misrepresentation. Nevertheless, the buyer will find it difficult to contact or locate the seller after the sale in practice. 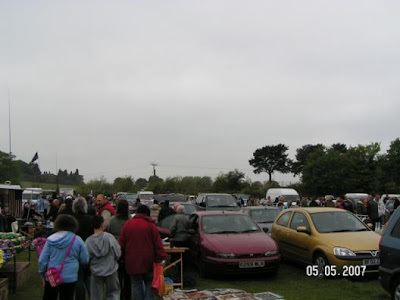 For some buyers, the random nature of the goods make car boot sales an interesting and exciting hobby. Although many of the goods on sale are not particularly useful, high quality or sought after items, there are exceptions. Young children’s shoes, clothes and toys are often discarded long before they wear out or lose their quality. Occasionally stories have made the papers of antiques or paintings being bought for a few pounds in a car boot sale and then sold in auction for thousands. Film collector Gordon Hendry, for example, purchased two episodes of the television series Doctor Who on 16 mm film at a sale in the early 1980s, paying £8 each. He later found that they were the only known surviving copies of these episodes (see Doctor Who missing episodes). 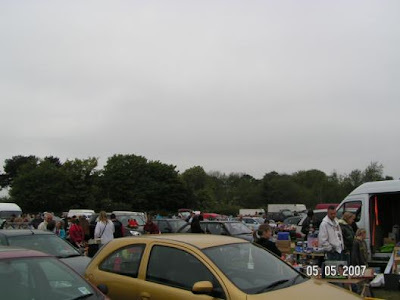 It is not unknown for stolen goods or pirated videos and DVDs to be sold at car boot sales. Last night was the grand finals of Britain's Got Talent. My bet, George Sampson won the prestigious talent show paving way to meet Prince Charles at the Royal Variety Show. Imagine, he never made it through the semifinals last year but with his fighting spirit and determination, he made it for the second time around this year. He danced breakdancing the tune of the oldies, Singing In The Rain. And the shower effect was fabulous. He was so confident from the start until the end. And he is such a cute boy to be fair. His routines are clean and radiant moves. From the start, he was my favourite and then, when the top 2 was announced, I was in delighted. The top 3 was called like Andrew Johnston, Signature and of course, George Sampson. Then, the 3rd placer was called and it was Andrew Johnston but he shed a lot of tears because he was expecting that he was the winner. Second place went to Signature dancing the Michael Jackson all time song, Billie Jean. When his name was announce, he could not stop crying, sign of joy and delight. Then he performed again his winning piece and the all the audience had given him a standing ovation, so as the judges. To you, George, best wishes and congratulations.